The city of Old Vinnengael was destroyed two hundred years ago in a magical blast that killed many thousands and forever changed the lives of everyone living on Loerem. Players in the Sovereign Stone campaign can travel back in time to explore that legendary city just days before its downfall. They can meet its people, shop in its fabulous markets, discover its treausre, encounter its dangers. 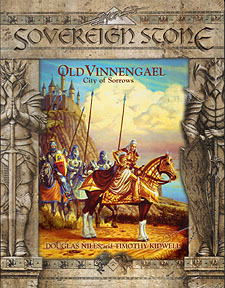 This sourcebook contains all the information a Game Master needs to use the city of Old Vinnengael as a campaign setting. Included are a large detailed map of the entire city and numerous smaller district maps for every portion of the city. The history of Old Vinnengael is provided, as well as descriptions of temples, inns, shops, palaces and other important buildings, along with descriptions of the influential people who live and worked there. Also included are descriptons of the various members of the royal family, who have brought about the rise of Old Vinnengael and who will be responsible for its destruction.